Elektron describe the Digitakt as a “Drum Computer and Sampler”, but it can actually do much more. Not only is it a full blown subtractive synth, but due to its unique LFO destinations, it can be used for quite a few other forms of synthesis, including granular, wavetable and more. Furthermore, by routing its MIDI sequencer back into the machine itself (either with or without creative interference on the way), it can be taught quite a few new tricks, like quick polyphonic sequencing, new LFO destinations, additional LFOs per track or cross track LFOs, and much more. Pulse width modulation is a great way that analog and virtual-analog synths take a square wave and breath life into it. The ongoing slow modulation of a square or pulse wave’s duty cycle results in an incredibly pleasing, rich sound. What, you may ask, does this have to do with samples? Well, if your sampler has the ability to apply modulation to its sample start point, that could result in PWM-style sounds, especially if the core sample you’re using is a single-cycle square wave. One thing you need to be aware of when trying this out – if you’re using a short sample, like a single-cycle waveform, as you modulate the start point – you need to leave enough room in the sample for the pitch to remain constant. If you can’t use a longer sample, there may be a “length” parameter that can be shortened to make sure the pitch remains constant. Luckily the Digitakt has both, so creating a PWM effect is quite simple. The Digitakt is fully capable of subtractive synthesis. With a dedicated multi-mode resonant filter per voice, amplitude and filter envelopes and an LFO with a variety of modes and destinations, the Digitakt can easily be viewed as a full fledged subtractive synth. As you get aquatinted with the Digitakt, you’ll encounter the terms “sample” and “sound”. This might be a bit confusing, as both get their own dedicated “pools”, and both have different capacity limits whether you’re looking at Digitakt as a whole, or specific projects. A SAMPLE is the raw audio recorded by a sampler or loaded as a file. A SOUND is the combination of the raw sample, along with any manipulation done to it on the Digitakt, including, for example, changing its pitch, adding effects, modulation, pitch changes, filters, etc. Overall, Digitakt is capable of storing 1 GB of samples (raw audio) and 2048 sounds. Now, when we dive in on a per project basis, it gets slightly more complex. Each project needs to load samples into dynamic memory, with 64MB available at any given time. Whether it’s 2 samples, 10 or 100, they can’t in aggregate take up more than 64MB for ALL the patterns in a given project. Finally, let’s talk about pools. There are sample pools and sound pools on a per project basis. You can load 127 samples into a Sample Pool (as long as you don’t pass 64MB) and 128 sounds into a project’s Sound Pool. The beauty of these pools is, while you cannot swim in them, you can choose any sample and any sound in a pool and assign it dynamically on a per step basis in your patterns. In theory the Digitakt doesn’t have built in support for playing polyphonically. It does have eight sound tracks that can play in parallel, and you can pitch notes in each track chromatically, but you can’t play or program two notes at the same time on one track. There are a few ways around that. One is to program chords, one note at a time across multiple tracks. That will take up four tracks though, and you can get around this by resampling this chord and consolidating it to one track, but then you’d be “stuck” with that chord and couldn’t change its components or transpose it nicely, as it would start getting longer or shorter depending on the pitch. Luckily, there are a few ways around this with a relatively simple “MIDI hack” – each with their advantages and advantages. All of these methods are different ways of taking a chord either from DIGITAKT’s MIDI sequencer (which is capable of sequencing chords) or an external source like a MIDI keyboard or computer, and splitting and spreading those notes across multiple Digitakt tracks dynamically in real time. Retrokits’ Smart Cable is one way of making this happen. While this cable may look like a simple MIDI cable, it actually has a processor in side it, and there’s a small piece of code available from Retrokits that takes MIDI from one channel and splits it across as many channels are you like. There are a few limitations to this method: One is that it will take up both your MIDI IN and MIDI OUT ports, and the second is that this cable requires a MIDI out jack that can supply enough power to the cable’s processor, which luckily the Digitakt can, but your MIDI keyboard or computer MIDI interface may not. I’ve not tried this cable, but I’ve heard from reputable sources that it works well. Another way to make this happen is using a Bome’s MIDI Translator Pro or BomeBox. This will require either a computer or a BomeBox, but has some advantages, such as not taking up your MIDI in and out ports (you can have MIDI flow in and out via Digitakt’s USB port), and that it works with any MIDI keyboard or interface. Once you have one of those solutions in place, you just play a chord on a MIDI track or external keyboard, and each new note gets dynamically shuffled across Digitakt’s audio tracks. You can record these live or sequence them and it just works. Notes get sent out the USB cable, or MIDI cables, and sent back and are allocated to the right track. Another cool feature of the Bome script (that may work with the other methods) is the ability to duplicate CC messages across all the tracks you’re playing on, so, for example, if you want to perform a filter sweep, you can have that work across all the notes of a chord, not just one individual track. Don’t underestimate Digitakt’s LFOs. Many of the ideas mentioned here use the LFO as a core source of making beautiful things happen. I’ll take you through a few of them below, but many of the LFOs treasures will be left unexplored in this article and are for you dig in and make magic with! FM, or frequency modulation synthesis has a unique character or timbre. The idea is simple, to take one sound – preferably a single cycle sine wave – to be our FM carrier, and wobble its frequency quickly using a fast sine wave LFO or oscillator (our modulator). Maintaining proper pitch requires precise control of modulation frequency and proper frequency ratios between the carrier and modulator, so this won’t turn Digitakt into a full fledged FM synth, but it’s still a great way to get evolving or percussive FM-style sounds. For extra credit, apply Digitakt’s “FADE” feature to the LFO and get FM-style sounds that evolve over time. You can create really nice granular synthesis type sounds by applying an LFO to the sample start point parameter. The idea is to grab little bits of a sample and attempt to freeze those bits in time, or at least stretch them out. The easy part is setting the LFO destination to sample start. Where it gets tricky is setting the right parameters – and this might be hit or miss. Check out the accompanying video for examples of settings that work well, but experimentation is encouraged. Wavetable synthesis is another form of synthesis or sound that can be emulated on the Digitakt. The general idea behind wavetable synthesis is that you cycle through two or more waveforms or samples. Ideally you’d also have the option to morph smoothly from one waveform to the other. On the Digitakt, we can do this by applying an LFO to the SAMPLE SLOT destination. You’d also need to prepare the samples you want to cycle through in your sample pool. This works nicely either with single cycle waveforms, or short samples. I’ve shown examples of both in the accompanying video. The LFO depth parameter determines how many samples will be cycled through. Unfortunately you can’t morph between two steps or samples on the Digitakt, but if you find or create a group of samples where one by one, a shape morphs from one sample to the other, across say 20 or 30 steps, you can simulate wavetable morphing. Digitakt has a built in function for adding ratchets on a per step basis, but you can’t assign that as a modulation destination. Luckily, you can achieve a modulated ratchet style effect by applying an LFO to the sample length – creating a very interesting rhythmic effect gradually moving through triplets, quarter notes or any other range you choose. Yeah, I know, that’s not really a form of synthesis, but still, it just sounds so cool I had to throw it in. Take a short sample to taste, apply a random LFO to it’s tune with generous amounts of delay and reverb, and voila! You’ll find yourself transported to a wet cavern of sonic delights. With so many uses for LFOs, you might want more than the one you get per track. A simple MIDI cable can help solve that problem. As a matter of fact, all the ideas from now on will use the same “Simple MIDI Loopback” concept to achieve different results. Once you have that set up, each of Digitakt’s 8 MIDI tracks has an LFO for controlling MIDI parameters. Just assign that to the CC of the parameter you want to control, and you now have 8 additional LFOs at your fingertips. Since Digitakt LFOs can also optionally cycle just once, you’ve got 8 more simple envelopes too. 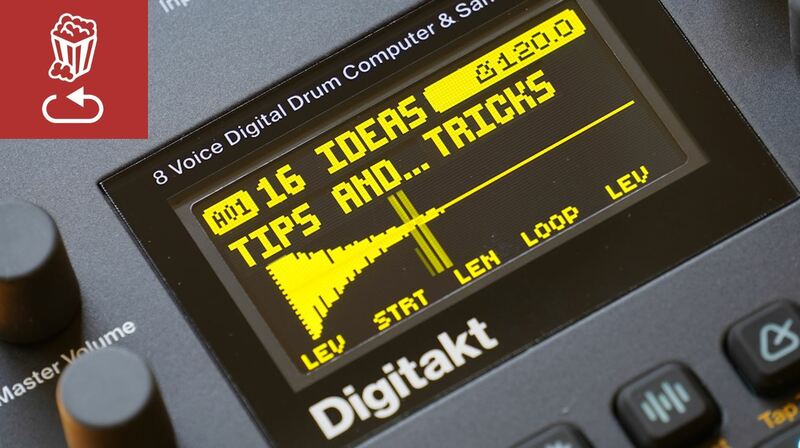 Digitakt doesn’t have (as of v1.10) a transpose track function. However, using a simple MIDI loopback cable we can parameter lock tuning changes, from MIDI tracks to the audio/sample tracks. The example shown in the accompanying clip shows a simple one bar pattern transposed across four bars, using a 4-bar MIDI track with tuning parameter locks applied on a per step basis. Because there’s a slight latency as MIDI travels around Digitakt, you may want to put the transpose parameter lock one step before the actual transposition needs to happen. Using trig conditions that occur once every number of loop reputations, you can easily create patterns that are more than four bars long. You can either trigger events, like transpose instructions show above, or just simple notes that happen every few bars, making patterns longer than 4 bars quite obtainable. Another way of breaking the 4 bar limit is chaining bars. Digitakt has a built in chain function, but at least as of firmware 1.10 those chains aren’t saved when you turn off your Digitakt. However, just as we sequenced tuning transpositions above, we can sequence Program Change events in a sequence as well. Just make sure you’re sending the Program Change event to the right channel. By default, Digitakt is set to receive these on MIDI channel 10. The final “Simple MIDI Loopback” trick for now will let you modulate destinations not currently available in the standard LFO destinations menu. For example, the delay, reverb and compressor parameters are all not available as modulation destinations for Digitakt’s LFO, however, the are available for control using MIDI CC messages. Check the manual for the CC number of the parameter you want to modulate, set on of the MIDI track LFOs to point to that CC, and the MIDI loopback cable magic will do that rest!